Wherever you are, RSQ's aeromedical services are there to help. If you haven’t heard of Retrieval Services Queensland (RSQ), you may not have needed it yet. But a new video and social media campaign from Queensland Health is set to emphasise the role of the unit, which forms the backbone of the state’s integrated aeromedical system and sits alongside Queensland’s emergency services and disaster management operations. RSQ coordinates the tasking of aeromedical retrieval and inter-hospital transport of patients across the whole of Queensland – from Coolangatta in the South to the Torres Strait in the North, and sometimes beyond. After a 000 call or a request from a hospital to transfer a patient, RSQ starts its work. It’s the nerve centre for emergency rescue operations that require helicopters or fixed-wing aircraft to get patients into safe hands in our state’s biggest hospitals. On top of that, RSQ provides 24/7 support via telehealth to 162 rural and remote sites to help hospital staff manage urgent and critical cases locally until a specialist team arrives. With centres in Brisbane and Townsville, RSQ employs 50 nurses, seven medical officers, 19 support staff and together with 15 Queensland Ambulance Service emergency medical dispatchers, operates around the clock all year. RSQ works hard to ensure every corner of Queensland is covered with ten rotary and seven fixed-wing aircraft bases. In total, RSQ tasks to 21 aircraft, travelling 5 million kilometres a year, to facilitate over 20,000 hospital transfers and rescues a year. 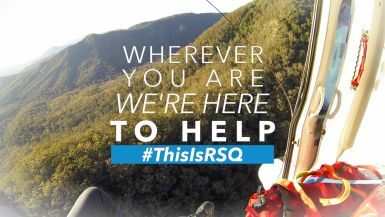 #ThisIsRSQ: Wherever you are, RSQ is there to help. RSQ: Leading excellence in specialist retrieval care.